The Brown Trout is an immigrant to the United States. The first successful importation occurred on February 24, 1883, when 80,000 fertilized eggs of European Brown Trout, Salmo trutta, arrived in New York Harbor aboard the steamship Werra. In the early 1880s, the native brook trout fishery in the eastern U.S. was showing signs of a rapidly declining population due to overharvesting, loss of habitat and stream pollution from the Industrial Revolution. Trout raised from the immigrant eggs were used to stock streams along the eastern seaboard and as brood stock for hatcheries. Initially the newly arrived Brown Trout was not met with acceptance by the local fishermen. The trout were considered to be invasive and a threat to replace native trout. The Brown Trout were more tolerant of warmer water and lower oxygen levels, were fast growing, could adapt to different stream conditions and grew larger than native trout. Eventually the larger browns replaced the smaller brook trout in many of the streams that could no longer support a brook trout fishery. The feeding habits of Brown Trout differ depending on the size of the trout. Smaller trout are often found feeding in drift areas in a stream. The smaller trout hold, almost stationary in clusters, waiting for food to come to them. Larger Brown Trout actively search for their food and show a diet fondness for fish – which isn’t appreciated by smaller fish! The smaller trout, which manage to survive, have learned not to feed in front of larger Browns. Brown Trout are known for moving into hiding cover at the first sign of movement along the stream bank. You’ll usually find them holding near dense cover like submerged logs, undercut banks, root wads, overhanging bank vegetation or dense aquatic plants. They feed on aquatic insects, terrestrials, crayfish, worms and other aquatic life. They find 80-90 percent of their food subsurface. 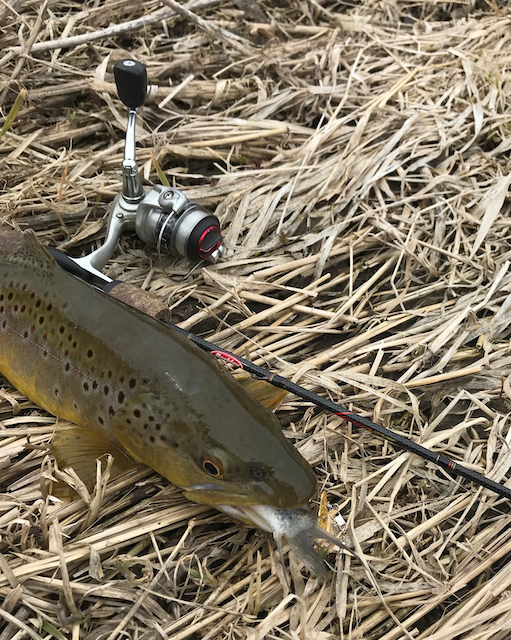 Anglers often find fishing for browns on overcast or lightly raining days to be very productive.